EAST PALESTINE — Lisbon senior Seth Stokes and Southern Local freshman Bradly Sloan are jumping for joy after winning at the 34th annual Bulldog Invitational on Saturday. Stokes, the defending Division III state runner-up, won the high jump for the third straight year by clearing 6-foot-6 at Reid Stadium. Sloan leaped to victory in the long jump (21-feet-3 1/2). Three area girls also captured first places. East Palestine senior Alexis Cunningham won the the 800-meter run (2:27.59). She was second last year after winning the event in 2016. 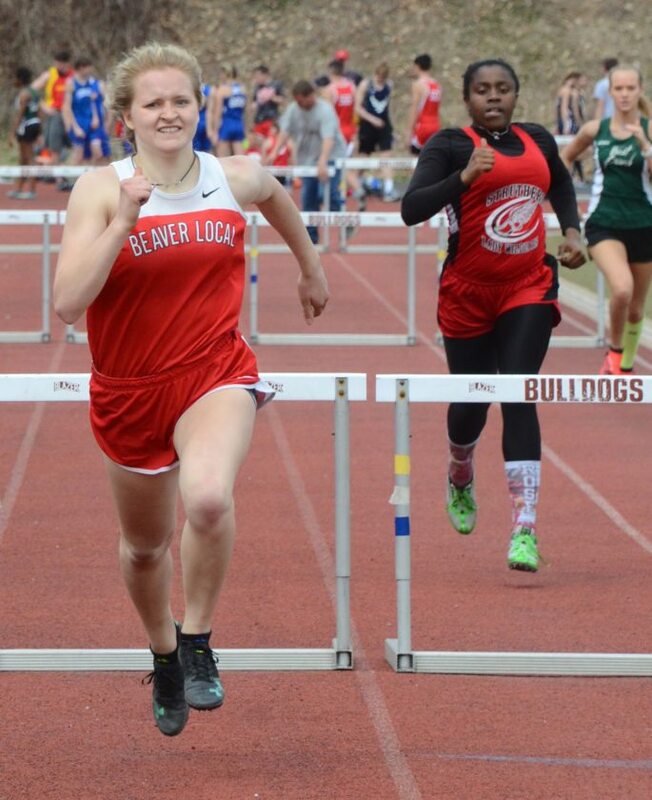 Columbiana senior Taylor Hall was first in the 300 hurdles (49.71 seconds) and Beaver Local sophomore Teddi Kinsey won the 100 hurdles (16.64). East Palestine sophomore Jaliyah Mixon was the girls field event MVP after taking second discus and the shot put. Poland’s Mia Musolino was the girls running event MVP. Boys MVPs were Mineral Ridge’s Nathan Chiclowe in the field events and Brookfield’s Dionte Colwell in the running events. McDonald swept the team titles for the fourth time in six years. The McDonald girls won for the fifth time in six years with 129 points. Poland was second with 110 and East Palestine third with 159. The McDonald boys won with 94 points, followed by Poland with 69 and Badger with 49. TEAM STANDINGS: 1. McDonald 94; 2. Poland 69; 3. Badger 49; 4. Lordstown 45; 5. Brookfield 44; 6. West Branch 42; 7. Steubenville Catholic Central 40; 8. Mineral Ridge 39; 9. Rootstown 29; 10. Cardinal Mooney 23; 11. Hubbard and Ursuline 22; 13. Southern Local, Beaver Local and Columbiana 15; 16. Mathews 13; 17. Struthers 12; 18. Western Reserve 11; 19. Lisbon 10; 20. East Palestine and Leetonia 7; 22. Lowellville 1. 3200 RELAY: 1. McDonald (Ethan Domitrovich, Brody Rupe, Connor Symbolik, Greg Dickson) 8:39.59; 2. Rootstown 8:47.31; 3. Steubenville Catholic Central 8:55.98; 4. Poland 9:04.61; 5. West Branch 9:12.58; 6. Ursuline 9:31.11; 7. Lordstown 9:31.93; 8. East Palestine 9:38.56. 110 HURDLES: 1. John Smith (Mathews) 16.26; 2. Brandon Greathouse (Badger) 16.51; 3. Seasn Kratzer (Ursuline) 16.57; 4. Jesse Rastetter (West Branch) 17.20; 5. Jimmy Plunkett (17.76); 6. Randall Miller (Mineral Ridge) 18.90; 7. Michael Herrman (Steubenville C.C.) 18.04; 8. Jack Carney (Columbiana) 18.98. 100 DASH: 1. Dionte Colwell (Brookfield) 11.36; 2. Dominic D’Amico (Lordstown) 11.65; 3. Zak Pappas (Beaver Local) 11.75; 4. Bradly Sloan (Southern) 11.8; 5. Jarred Miller (Mineral Ridge) 11.93; 6. Nico Marchionda (Cardinal Mooney) 12.02; 7. David McKeiver (West Branch) 12.06; 8. Devin Moore (Badger) 12.08. 800 RELAY: 1. Poland (Rocco Almasy, Colin Roarty, Zaire Fabian, Mitchell Fredrick) 1:32.96; 2. Brookfield 1:33.69; 3. Struthers 1:35.74; 4. McDonald 1:37.73; 5. Cardinal Mooney 1:38.26; 6. Rootstown 1:39.84; 7. Badger 1:40.62; 8. Mineral Ridge 1:40.73. 1600 RUN: 1. Ethan Domitrovich (McDonald) 4:48.03; 2. Geno Gallo (Poland) 4:49.50; 3. Brody Rupe (McDonald) 4:51.1; 4. 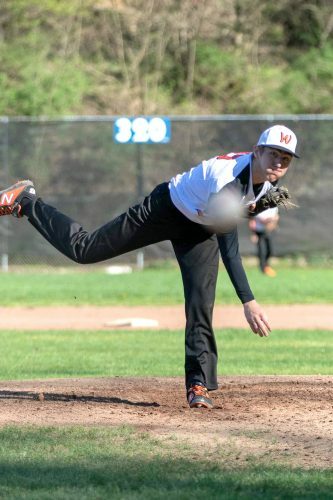 Patrick Kuebler (Steubenville C.C.) 4:51.64; 5. Jacob Zahoransky (Badger) 4:51.84; 6. Carlin Long (Steubeville C.C.) 4:55.70; 7. Mason Matiste (Poland) 5:01.36; 8. Anthony Sanchez (Lowellville) 5:01.36. 400 RELAY: 1. Brookfield (Haden Gibson, Alex Bell, Alex Clark, Dionte Colwell) 45.05; 2. Cardinal Mooney 45.44; 3. Columbiana 46.30; 4. West Branch 46.35; 5. McDonald 46.52; 6. Struthers 46.56; 7. Beaver Local 47.25; 8. Rootstown 47.31. 400 DASH: 1. Rocco Almasy (Poland) 51.72; 2. Tyler Worrell (McDonald) 52.14; 3. Jarred Miller (Mineral Ridge) 52.34; 4. Johnathan Cress (Leetonia) 53.01; 5. Zion Willis (Cardinal Mooney) 53.12; 6. Zach Simon (Ursuline) 53.13; 7. Alex Bell (Brookfield) 53.67; 8. Carson Gossett (West Branch) 53.76. 300 HURDLES: 1. Devin Moore (Badger) 41.89; 2. Jesse Rastetter (West Branch) 42.44; 3. Brandon Greathouse (Badger) 43.61; 4. Joseph Bable (Columbiana) 44.32; 5. Zack Canada (McDonald) 44.40; 6. Randall Miller (Mineral Ridge) 44.44; 7. John Smith (Mathews) 44.97; 8. Ryan Gates (Mathews) 45.43. 800 RUN: 1. Steve Babik (Ursuline) 2:04.75; 2. Ethan Domitrovich (2:05.00); 3. Geno Gallo (Poland) 2:10.66; 4. Brody Rupe (McDonald) 2:11.15; 5. Roger Williams (McDonald) ; 6. Johnny Ross (WEst Branch) 2:11.75; 7. Matt Hough (Cardinal Mooney) 2:13.69; 8. Griffin Lough (West Branch) 2:14.45. 200 DASH: 1. Dionte Colwell (Brookfield) 23.01; 2. Dominic D’Amico (Lordstown) 23.18; 3. Tyler Worrell (McDonald) 23.58; 4. Jared Southern (Hubbard) 23.82; 5. Jordan Beyah (Lordstown) 24.14; 6. Zaire Fabian (Poland) 24.16; 7. Johnathan Cress (Leetonia) 24.29; 8. David McKeiver (West Branch) 24.32. 3200 RUN: 1. Colin Brown (Steubenville C.C.) 10:26.96; 2. Sammy Dwyer (Poland) 10:36.74; 3. Jeff Joseph (West Branch) 10:42.57; 4. Lincon Hopkins (Badger) 10:48.1; 5. Connor Symbolik (McDonald) 10:53.57; 6. Patrick Kuebler (Steubenville C.C.) 10:55.68; 7. Anthony Gallo (Poland) 10:57.09; 8. Jett Pailus (Rootstown) 11:02.17. 1600 RELAY: 1. Lordstown (Jermaine Jones, Jordan Beyah, Greg Romain, Dominic D’Amico) 3:37.61; 2. Badger 3:37.69; 3. Poland 3:38.71; 4. McDonald 3:40.54; 5. Mineral Ridge 3:43.21; 6. Western Reserve 3:45.32; 7. Hubbard 3:46.91; 8. Struthers 3:51.13. DISCUS: 1. Zach Gray (McDonald) 148-9; 2. Logan Carpenter (Rootstown) 146-11; 3. Nathan Chiclowe (Mineral Ridge) 145-3; 4. Vince Oliver (Steubenville C.C.) 137-6; 5. Kameron Stofko (McDonald) 125-9; 6. Seth Jones (Hubbard) 124-1; 7. Antionio Tedesco (Mineral Ridge) 120-1; 8. James Stefanski (Struthers) 118-2. SHOT PUT: 1. Nathan Chiclowe (Mineral Ridge) 50-6; 2. Matt Henry (Western Reserve) 49-7.25; 3. Vince Oliver (Steubenville C.C. 47-9.75; 4. Zach Gray (McDonald) 47-5.25; 5. Logan Carpenter (Rootstown) 46-4.25; 6. Drew Davies (Poland) 44-9.25; 7. Kyle Jornigan (Cardinal Mooney) 44-9; 8. James Stefanski (Struthers) 44-1. LONG JUMP: 1. Bradly Sloan (Southern) 21-3.5; 2. Dominic D’Amico (Lordstown) 21-0.25; 3. David McKeiver (West Branch) 20-0.25; 4. Josh Speelman (Beaver Local) 19-7.5; 5. Jared Southern (Hubbard) 19-6.25; 6. Joseph Bable (Columbiana) 19-4.25; 7. Nicholas Frank (Lordstown) 19-3; 8. Richard Bailey (Poland) 19-1.5. HIGH JUMP: 1. Seth Stokes (Lisbon) 6-6; 2. Jared Southern (Hubbard) 6-06; 3. Stephen Darlington (East Palestine) 6-2; 4. Blake Wilson (Poland 6-0; 5. Connor Stevens (Brookfield) 5-10; 6. Greg Romain (Lordstown) 5-10; 7. Brandon Bowyer (Beaver Local) 5-8; 8. Scotlund Shaffer (Badger) 5-6. TEAM STANDINGS: 1. McDonald 129; 2. Poland 110; 3. East Palestine 59; 4. Badger 44 1/2; 5. Rootstown 38 1/2; 6. Columbiana 37; 7. Beaver Local 36; 8. Weir and Mathews 26; 10. Steubenville Catholic Central 24; 11. West Branch 23 1/2; 12. Lordstown 15; 13. Mineral Ridge 13; 14. Struthers 11; 15. Western Reserve 10; 16. Hubbard 6; 17. Lisbon 4; 18. Brookfield 3 1/2; 19. Ursuline and Cardinal Mooney 3; 21. Leetonia 3. 3200 RELAY: 1. McDonald (Janessa Martinelli, Malina Mitchell, Bella Wolford, Sela Jones) 10:13.53; 2. Poland 10:22.90; 3. Badger 10:49.62; 4. West Branch 10:59.18; 5. Beaver Local 11:09.14; 6. Columbiana 11:41.83; 7. East Palestine 11:55.10; 8. Rootstown 12:07.29. 100 HURDLES: 1. Teddi Kinsey (Beaver Local) 16.64; 2. Naomi Domitrovich (McDonald) 16.68; 3. Keasia Chism (Struthers) 17.45; 4. Amanda Romain (Lordstown) 17.64; 5. Juli Jones (East Palestine) 17.71; 6. Ella Harrell (Poland) 18.48; 7. Nevaeh Crus (Mineral Ridge) 18.82; 8. Kiersten Tricker (Badger) 19.59 . 100 DASH: 1. Mia Musolino (Poland) 13.16; 2. Alexis Washington (Rootstown) 13.60; 3. Carlie Pratt (Mathews) 13.75; 4. Caroline Fodor (Weir) 13.86; 5. Izabella Strohecker (Columbiana) 13.87; 6. Khaylah Brown (Struthers) 13.89; 7. Karlie Vanderbone (Steubenville C.C.) 13.97; 8. Josie Shultz (Mineral Ridge) 13.98. 800 RELAY: 1. McDonald (Naomi Domitrovich, Abbie Matig, Olivia Perry, Jessica Stamp) 1:50.39; 2. Poland 1:52.61; 3. Rootstown 1:53.57; 4. Steubenville Catholic Central 1:55.6; 5. Weir 1:56.08; 6. Cardinal Mooney 1:56.59; 7. Columbiana 1:59.22; 8. West Branch 2:00.06. 1600 RUN: 1. Malina Mitchell (McDonald) 5:21.66; 2. Alexis Cunningham (East Palestine) 5:24.80; 3. Miranda Stanhope (Badger) 5:36.91; 4. Halle Sebest (Poland) 5:45.44; 5. Emily Zimmerman (East Palestine) 5:51.77 6. Gianna Stanich (Poland) 5:51.78; 7. Alyssa Lynch (McDonald) 5:35.0; 8. Emma Hunkus (Badger) 5:45.0. 400 RELAY: 1. Rootstown (Paige Cremeans, Emily Drago, Alexis Washington, Meaghan Hahn) 52.27; 2. Poland 52.29; 3. Steubenville Catholic Central 53.85; 4. Western Reserve 55.10; 5. Columbiana 55.22; 6. McDonald 56.10; 7. Mathews 56.50; 8. West Branch 56.52. 400 DASH: 1. Caroline Fodor (Weir) 1:00.68; 2. Jackie Grisdale (Poland) 1:03.31; 3. Rebecca Bodo (Steubenville C.C.) 1:03.74; 4. Abbey Strohmeyer (Mineral Ridge) 1:04.30; 5. Abbie Matig (McDonald) 1:04.35; 6. Olivia Perry (McDonald) 1:04.86; 7. Klara Crisp (Columbiana) 1:05.03; 8. Faith Cole (Rootstown) 1:05.03. 300 HURDLES: 1. Taylor Hall (Columbiana) 49.71; 2. Teddi Kinsey (Beaver Local) 49.91; 3. Naomi Domitrovich (McDonald) 51.23; 4. Ella Harrell (Poland) 51.27; 5. Carly Scarpitti (West Branch) 51.31; 6. Gabby Romano (Poland) 52.35; 7. Keasie Chism (Struthers) 52.36; 8. Nevaeh Cruz (Mineral Ridge) 53.38. 800 RUN: 1. Alexis Cunningham (East Palestine) 2:27.59; 2. Sela Jones (McDonald) 2:28.24; 3. Bella Wolford (McDonald) 2:32.41; 4. Gianna Stanich (Poland) 2:37.05; 5. Klara Crisp (Columbiana) 2:38.27; 6. Katie Stinson (Hubbard) 2:39.60; 7. Halle Sebest (Poland) 2:40.32; 8. Ava Decker (West Branch) 2:45.45. 200 DASH: 1. Mia Musolino (Poland) 26.95; 2. Meaghan Hahn (Rootstown) 27.66; 3. Caroline Fodor (Weir) 27.79; 4. Jessica Stamp (McDonald) 28.28; 5. Brooke Lewis (McDonald) 28.90; 6. Chloe Kosco (Poland) 29.08; 7. Sophie Klase (McDonald) 13.43.03; 8. Savannah Munger (Rootstown) 14:53.28. 3200 RUN: 1. Miranda Stanhope (Badger) 12:03.90: 2. Maggie Sebest (Poland) 12:08.19; 3. Anna Guerra (McDonald) 12:25.57; 4. Emily Zimmerman (East Paelstine) 13:03.73; 5. Alexis Cunningham (East Palestine) 13:27.61; 6. Emma Hunkus (Badger) 13:39.28; 7. Sophie Klase (McDonald) 13:43.03; 8. Savannah Munger (Rootstown) 14:53.28. 1600 RELAY: 1. McDonald (Sela Jones, Olivia Perry, Malina Mitchell, Jessica Stamp) 4:16.53; 2. Poland 4:28.85; 3. Beaver Local 4:31.07; 4. Steubenville Catholic Central 4:32.94; 5. West Branch 4:36.50; 6. Mineral Ridge 4:41.86; 7. Lordstown 4:44.34; 8. Hubbard 4:46.39. DISCUS: 1. Olivia Lovas (McDonald) 110-5; 2. Jaliyah Mixon (East Palestine) 106-5; 3. Angelina Sophia Thompson (Columbiana) 101-6; 4. Claire Miller (Mathews) 100-10; 5. Trinity Hobbs (McDonald) 99-8; 6. Miyah Martin (Ursuline) 99-2; 7. Arianna Russell (Leetonia) 97-11; 8. Natalie Zuchowski (West Branch) 96-8. SHOT PUT: 1. Claire Miller (Mathews) 35-4.25; 2. Jaliyah Mixon (East Palestine) 34-0.25; 3. Natalie Zuchowski (West Branch) 33-11; 4. Olivia Lovas (McDonald) 32-11.5; 5. Maddie Liberati (Lisbon) 32-2.25; 6. Alicia Connelly (Poland) 31-9.25; 7. Kaitlyn Johnson (McDonald) 29-11; 8. Katie Moore (Rootstown) 29-8.5. LONG JUMP: 1. Chloe Kosco (Poland) 16-2.25; 2. Teddi Kinsey (Beaver Local) 15-1.75; 3. Marlaina Frye (East Palestine) 15-1.75; 4. Maddie Owen (Western Reserve) 15-0.5; 5. Kiersten Tricker (Badger) 14-7.75; 6. Carlie Pratt (Mathews) 14-5.75; 7. Madison McGowan (Hubbard) 14-5.5; 8. Mackenzie Holloway (Weir) 14-4.5. HIGH JUMP: 1. Kiersten Tricker (Badger) 5-0; 2. Cadence Lickwar (Lordstown) 4-10; 3. Abriella Gillespie (McDonald) and Olivia Perry (McDonald) 4-10; 5. Dana Sydlowski (Brookfield) and Suzanne Shafer (Badger) 4-8; 7. Sarah Dresp (Rootstown) 4-8; 8. Shaelyn Stefanick (Rootstown) and Mikaela Whaley (West Branch) 4-6.